TeraPeak Review. eBay Market Research. How & What to sell on eBay. What to Sell and How to Sell on eBay to Boost Your Profits 25%-50%. Market research is crucial “MUST” for serious eBay business, and performing this without proper market research software is impossible. So if you’re selling more than $500 a month worth of products you need eBay market research software like Terapeak. Read detailed textual review of Terapeak below and check out in depth video tutorials to learn how to sell on eBay more profitably, discover hot selling products to sell, make more money on every listing and outsell your competitors using market research. 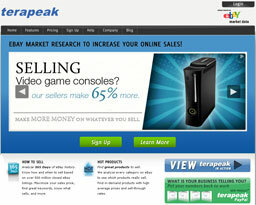 Terapeak is a leading eBay market research tool. Let me emphasize that: “Market Research”. If you want to sell profitably you need a market research, because you need to be in control of your eBay auctions. You need to know how much profit you can make from a product before you sell it, how to be better than your competitor, how to make more money from every listing. And that is what Terapeak is all about. This eBay market research tool will help you to develop solid sale strategy, discover products trends, top sellers you have to compete with, hot products and categories and at the end of the day will help you make more money on every listing. Terapeak gives you insight information about what to sell, how to sell and when to sell to make most of the money. Most of your competitors have never seen this valuable data and this gives you unfair advantage to be head and shoulders above them. Search millions of closed eBay listings – see what sells, what doesn’t. Determine profit potential for any product; with that knowledge pick the most profitable product. View the top sellers by eBay category for sales, volume and total bids – this gives you an idea of how many serious players you have to compete with. Research your competitors’ sale strategy, analyze, improve it and take the top spot. Understand category patterns & make informed decisions – see categories with the highest bid and sale activity and choose the right product. When you understand which are the most profitable categories you can adjust your product sourcing strategy, and that leads to more sales. One of the easiest ways to get products is drop shipping. Check Worldwide Brands review to find out how you can get thousands of great products to sell on eBay at wholesale prices. See product sale fluctuations in different times of the year (seasonality of your sales items) – trends. They will help you find seasonal products (wedding favors, St. Valentines cards, barbeque grills etc). You can buy them dirt cheap off-season, and sell much higher during the season. You can also see trends in the closing times of successful auctions, which will help to increase the effectiveness of your auctions and ultimately increase your profit. View super hot, very hot and hot categories, media (DVD, books, games), searches (see what buyers are searching on eBay), products and titles (See Top products overall on eBay and in specific categories, drill down to specific makes and models). Terapeak used to have free research tool with limited features but now they replaced it with 7 days free trial, where you get to try all the bells and whistles for a week. Terapeak will email you before your trial is due to expire. If you do not cancel the account, your method of payment will be billed seven days after you sign up for the trial. Your trial account will become your permanent account (all of your customizations, preferences, and any Value Track settings). If you wish to cancel before your trial is up, either cancel via your “my account page” in the tool, or contact their support team at support@terapeak.com(I would recommend to do both just to be safe). For newbie, mountains of data could be pretty overwhelming, especially without understanding what the data means. To get a better understanding how to use software for research I would recommend watch training videos on this page and check out video lessons on Terapeak’s website, they will help you to make your research more effective. Watch video tutorials below and learn how to increase sales and profit with Terapeak market research. Not sure about Terapeak? See it compared to other eBay Market Research tools. In this video you will learn how to make more money on eBay by finding and tracking profitable products and sellers in any niche. Comparing market research data from leading tools (HammerTap and Terapeak), I can say that they use the same data source, the only difference is representation form – Terapeak is more intuitive and easy to understand, which is good for beginners. They are a Certified Provider and their software has close integration with eBay platform. This gives you an assurance that your research is based on real data and not skewed by some outdated numbers. Have you ever looked at an eBay “What’s Hot list?” . These lists are great at giving some initial direction, but what do they really mean to you? Yes, you might find out that 16 Gb iphone is extremely HOT item in Consumer Electronics. So what? If you don’t know where to get iphone for wholesale/reasonable price you are not going to make any money from it. So this item is NOT that HOT for your business. What do you mean, “What’s hot for me depends on what I can sell”? If it is being sold on eBay, why wouldn’t I be able to sell it? A lot of factors go into ability to sell a product. For example, firstly you need to understand the supply and demand of that product, and then you need to be able to find a product source/drop shipping directory with wholesale prices. Find out the supply and demand. You should never commit selling a new product without trying to gauge what the demand for that product will be! With Terapeak it is easy. Search a product you think is right for you and check the Results for the Total Listings (supply) and Sell-Through (demand). Now having the right product you need a product source. You can check Worldwide Brands review to learn more about where you can find products at wholesale prices to sell on eBay. So, by now you should have discovered a hot-selling product, determined its supply and demand within the market, and found out where you can get it. Unfortunately, that is only one side of the equation. Although you are confident you can sell it, do you know how much money you can make? Terapeak will help us again. Check Average Selling Price (ASP). But we won’t sell it at the average – using market research tools and determine proper selling strategy we can significantly boost our selling price. Usually my selling price was 25% higher (on average) than regular ASP, because I was able to leverage great description, right timing, keywords and features in my auctions. That’s why market research is crucial “MUST” for serious business, and performing this without proper market research software is impossible. So if you’re selling more than $500 a month worth of products you need eBay market research software. You are making money selling products online, and if you’re selling better/more than your competitors you’re making more money – everything is simple. Prevent you from many costly mistakes and put you head above your competitors. 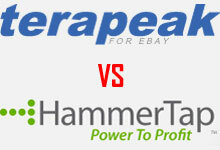 Terapeak and HammerTap are tools, I think, any seller should not be without. You can try them for free. If you’re new to eBay research tools I would recommend Terapeak as more intuitive and easy to use. I’ve used Terapeak for a couple of years now and have really liked the information. Yes, there were ups and downs in terms of some features, layout and user interface. The one they rolled out in 2008 was terrible, but they quickly fixed it. As an eBay seller, the data they provide is extremely valuable in understanding the products and sellers I’m competing against, the prices, trends and ability to spot changes early is priceless. Even free version provides some great value. Highly recommend it. Overall Terapeak is good but their website is kind of slow for me and I don’t like their title builder tool, it doesn’t give you granular insight on what keywords will increase your end price and sell-through rate. Yes, if you have slower connection and dealing with a lot of data their analytics can be slow, especially if you’re outside of US and Canada, I wish they add content delivery network so the data can be streamed fast no matter where you’re. Great application, increased my sales 25%, I have tried Hammertap before and was turned off by non-existing customer support and clunky interface. The downside of Terapeak – their tutorials don’t tell you much how to research to make more money, they show you basic functions of the software but do not explain why and how to use those features to increase sales. Terapeak has instituted higher fees for new registrations, and not allowing expired credit cards to simply update their card information to continue old registrations. From what I’m hearing, subscribers are leaving in droves as soon as their current credit cards expire and they have to re-register at the higher rates. Mine expired today. The new price hike makes it impossible for me to continue using this product. Bye Bye Terapeak! Yes, you’re right, in 2012 they have raised their prices $5 for Domestic “Single market” package and $10 for International and Motors “All Markets” package, but what was your volume of sales that $5-10 price hike made it impossible to use their product? If you sell less than $200 a month then I agree it is inappropriate to pay $29.95 for analytics but if you sell more than $200 you should see positive ROI. I used Terapeak before, but I found the data to be inaccurate. Some of the data just can’t be right, for example when I search for an ipod, it gives me average price of $26? I know for a fact that’s not how much it’s worth, because I sell them. It has some nice features, but overall I’m not impressed with the data, it’s misleading. Also it’s takes forever to do a basic search.